I first had Steak Tartar in The Ivy, London. So from the outset, the benchmark was set pretty high! I totally adore this dish and had to get it right, a lot of research went into it. My weekend treat with a lush glass of Rioja! Lush!! Start by trimming the outsides of the steak. Also remove any obvious white and silvery pieces. Wash the knife and chopping board. Pop the steak into the freezer for around 20mins – half an hour to firm up, this makes it easier to cut. While it is in the freezer, prepare the rest of the ingredients by adding them into a bowl and combining well. Taste and adjust if necessary. When the steak is ready, take it out and on a chopping board, cut across the grain into slices. Then cut the slices into strips and then cut the strips into little cubes, roughly 2-3mm pieces. This bit can be done in advance, wrapped tightly in plastic put in the fridge until ready to serve. Once you are ready to serve, combine the meat and the dressing. Add half the dressing to begin with, add more if necessary. Shape into patties, place in a ring to give a nice shape. Serve, topped with the egg yolk and the chives, accompanied by the toasted sourdough! Tip: I toasted my sourdough then put it into the oven at 160c for 8 mins to really crisp it up. Healthy Start to the New Year! The New Year will see me up the ante with my fitness regime and this includes the food I eat! In a nutshell you will see a lot of healthy alternatives this year. What I do promise is no compromise on taste. Bland steamed chicken and veg does not do it for me, but simple tweaks and boom, you can have you cake and eat it…so to speak!! Tonight I was tight for time and this is what I rustled up…. I feel guilty putting down an ingredient list it is sooo simple! Simply add a dash of oil to a frying pan, heat until super hot, add the steak and cook both sides to your preference, in my case, rare. Set aside, add a dash of oil to the frying pan and heat. Throw in the stir fry and the chilli, after a couple of mins, chuck in the soy, fish sauce and lime juice. 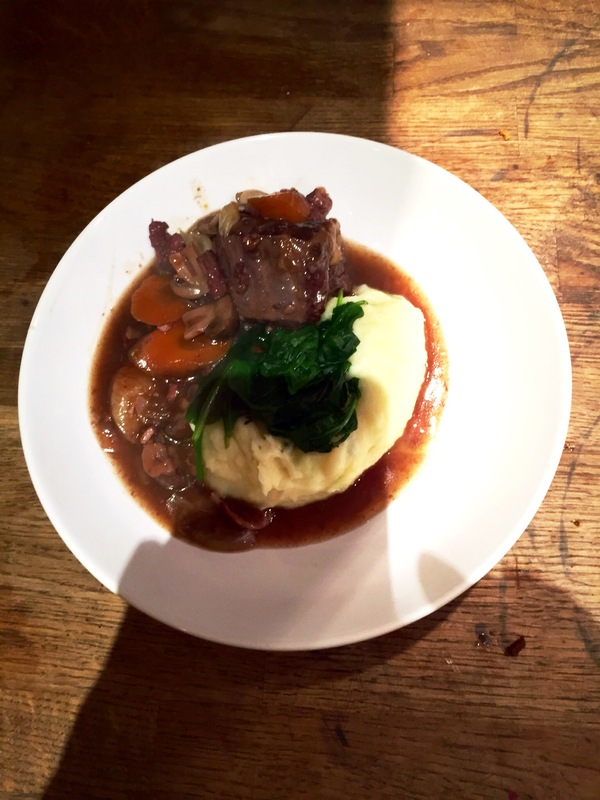 It has started to get a bit chilly and with Autumn in full swing, nothing beats a hearty stew. I did this in my slow cooker, it can be done in the oven too. Pour a large glass of red wine and get tucked in….food heaven!! Prepare the slow cooker or a large casserole dish. Heat oil in a casserole dish or frying pan and fry the beef, browning well a few pieces at a time. Remove from the casserole, add the onion. Fry gently for 5 mins, then add the garlic for another few mins. Put the beef back in and stir well, stir through the flour and cook gently for a minute or so. Mix in the wine gradually then the stock and stir well. Add the tomato Purée and stir again. Add the thyme, bring to the boil and transfer to the slow cooker at this point if you are using and stir through the vegetables. Cover and cook for 7-9 hours on low. Meanwhile make the dumplings. Mix the flour, suet, horseradish, chives, salt and pepper. Stir in enough water to make a soft but not sticky dough. Using floured hands, shape into eight balls. Add to the slow cooker and cook on high for another hour or until the dumplings are fluffy and light. If you are not using a slow cooker, transfer to an oven heated to 170c for 3-4 hours. Add the dumplings after one hour. 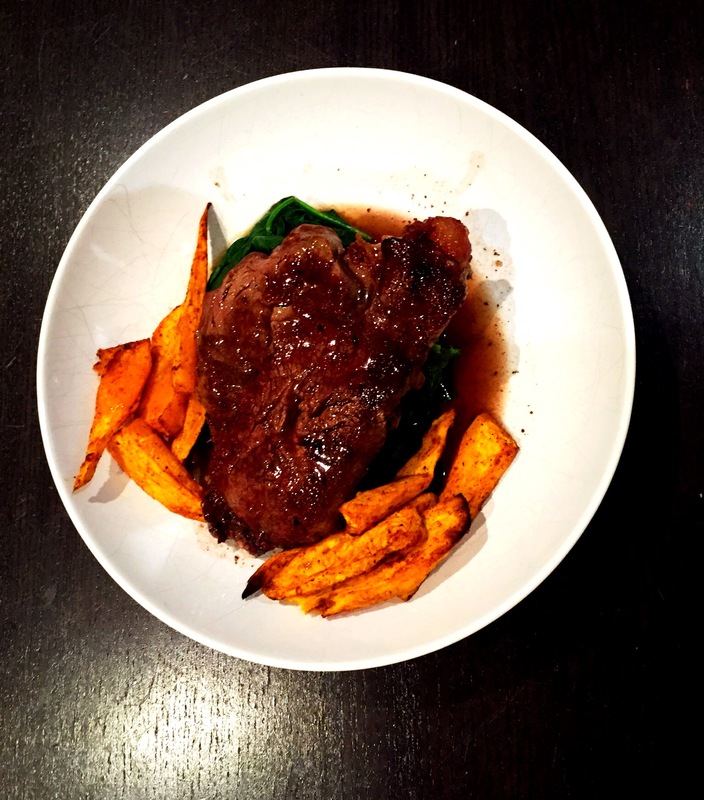 This cut of meat is total luxury when it comes to slow cooked beef! It transforms from one of the lesser attractive cuts of beef to the most amazing velvety soft beef you will ever taste. It is unique in its richness and a top notch dinner party option for both taste and ease. Serve with greens and champ for sheer perfection! In a large casserole dish, add a dash of oil and really brown the beef cheeks all over. Do this a few at a time. Add a dash more oil if needed and throw in the onion, celery, carrot and garlic and soften for 5-7 mins. Dust the beef cheeks with roughly a tablespoon of seasoned flour. Return the the casserole. Cook for another couple of minutes, then add the red wine, thyme and stock. Stir well and bring to the boil, turn down to a simmer and then transfer to the oven. Cook for 3 1/2 hours. You can make this stretch for miles, chuck a variety of whatever root veg you fancy in and eat it for a couple of days! Another big advantage for me is my kids prefer the mince to big chunks of beef. In a large pot, heat up high and add your mince. Fry on a high heat until well browned all over and periodically drain out any fat (keeps it super healthy). Remove beef from the pot, add a splash of oil and then add the onion, fry over a medium heat for five mins. Add the carrots, celery and garlic and continue to cook for another five minutes. Return meat to pot, add the wine, potatoes, stock and bouquet garni and stir. To season add salt, pepper and a tablespoon of Worcestershire sauce…adjust to your taste. Cook gently for an hour stirring from time to time. You might want to use a fork to break up the potato if it has not already broken up. This is a wonderful make ahead dish I use for swimming lesson nights, just come in, switch it on, cut up the crusty bread and enjoy!! Following on from my recipe for my Ragu Bolognese, a few extra steps gets you a lasagne! Boom! So, you have made your Ragu Bolognese, now to convert your Ragu Bolognese into lasagne…. This is the basic white sauce recipe for many dishes. In this instance, lasagne! The classic recipe has a blade of mace and nutmeg in it, I have left these out. Also, for a lasagne, you cannot have enough of the stuff, I have learnt through past attempts to double the quantity as it is better to have too much than run out!! So for a large lasagne serving 6-8 people, double up the quantity stated here! Pour the milk into a heavy based saucepan and add the onion, bay leaf and pepper corns. Gently bring to the boil then remove from the heat. This ensures your milk does not burn. Cover and set aside for 15 mins to infuse, then strain into a jug. Clean the pan, then add the butter over a medium heat until melted. Add the flour, cook gently stirring occasionally for around 1 minute. Take care not to burn the flour. Now for the tricky bit…add the milk, gradually whisking with a balloon whisk after each addition. Don’t stop whisking or it could go lumpy. Return the pan to the heat, whisking continuously and bring to the boil. Reduce the heat and simmer really gently for 2 mins stirring from time to time. It should be smooth and thick. Add the cheese and stir from time to time until melted. Add salt and pepper to taste. Now to assemble the lasagne. Melt a small amount of butter and using a pastry brush, coat the entire bottom and sides of your dish. This stops it from sticking. Lay your first layer of lasagne sheet on the bottom of the dish, top with the ragu, keep it nice and neat and flatten it a bit, top with a drizzle of the Béchamel sauce. When doing your layers of lasagne, keep them nice and neat with as little overlap as possible but no gaps for the sauce to fall through. Now add another layer of lasagne, and again top with the ragu and some Béchamel. Whilst adding your Béchamel just ensure you always keep the majority for a nice thick layer on the top. Finally add the last layer of lasagne and top with lots of gorgeous Béchamel! At this stage you are ready to pop it into the oven for around 40-50 mins, until cooked through and nice and golden on top. Or if you prefer, you can finish at this stage and freeze for a later date. A bit of work to get it all put together…once it is in the dish…reeelax!! Warning!!!! This dish is super healthy and super tasty!!! Peel and chop the sweet potato into wedges. Throw the sweet potato into a freezer bag, add a dash of oil, the chilli powder and some salt and pepper. Mix it up well in the bag, add to a heated oven tray and cook for 30-40 mins until soft and golden. Just before the potatoes are ready, it is steak time! Season both sides with lots of salt and pepper. Add a dash of oil to a heavy frying pan. Heat until super hot and then add the steak. Cook according to how you like a steak…there is no set time to cook it, as they vary in size and thickness. However I remember once hearing a steak cooking guideline which I feel is fairly accurate. Using your index finger against your forehead for well done, chin for medium and cheek for rare! With Autumn upon us, there could be nothing more appealing than the perfect comfort food. 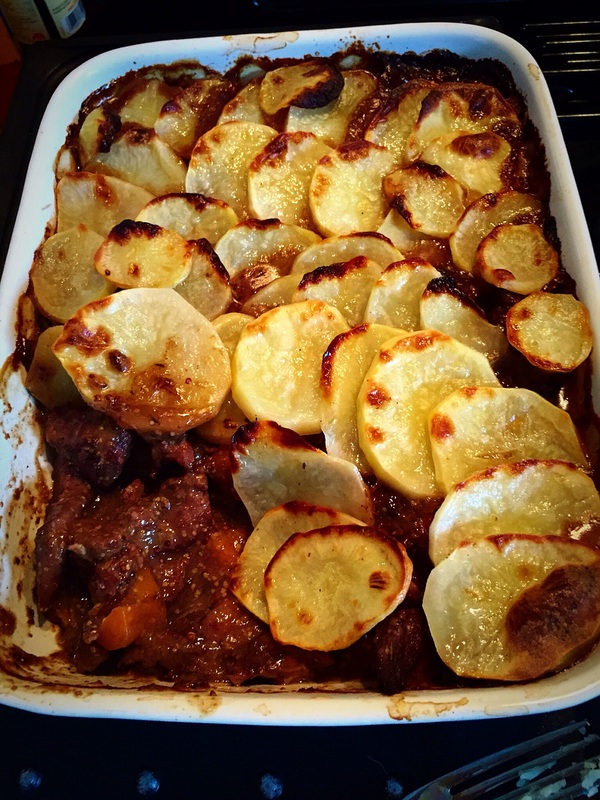 For me a luxurious casserole with creamy mash represents comfort food at its best!! Toss all the beef pieces in the seasoned flour. Heat the oil in a heavy bottomed casserole dish until really hot, brown the meat on all sides and remove from the pan. Add a dash more oil and throw in the onions and carrots, turn the heat down and fry gently for about five minutes. Add the garlic and cook for a further two minutes. Add the beef back to the dish along with the red wine, bring to the boil. Add the bouquet garni and season. Replace the lid and place in the oven for one hour. Whilst it is in the oven, add a dash of oil to a frying pan and when really hot, tip in the bacon lardons and cook for a couple of mins. Add the peeled shallots and cook until the shallots are nice and brown and the lardons are crispy. After an hour, add the shallots, lardons and mushrooms. Cook for a further 2-2 1/2 hours, until the meat is totally tender. You may need to add a dash of water if too thick. If too thin, you could use some cornflour. Serve with some fresh wilted spinach and super creamy mash! Lush!! 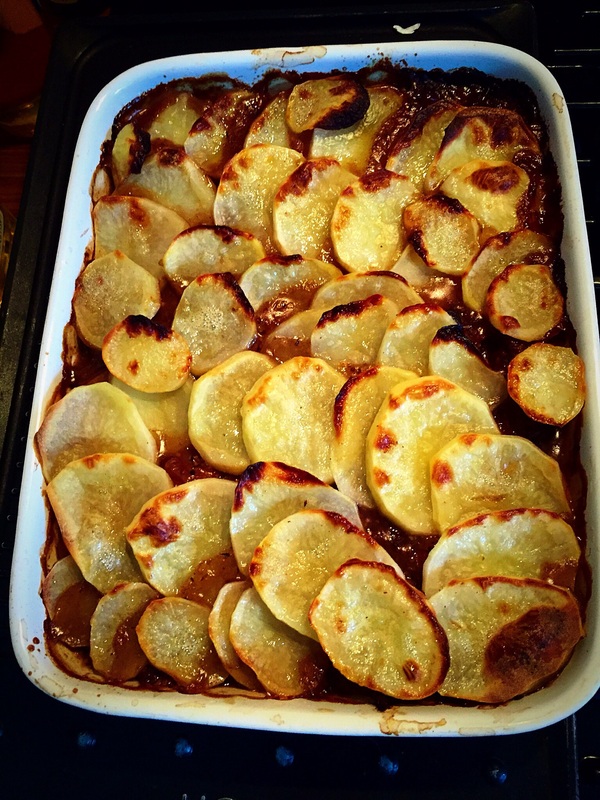 It is feeling a touch chilly for September making me want some lush, wholesome comfort food! 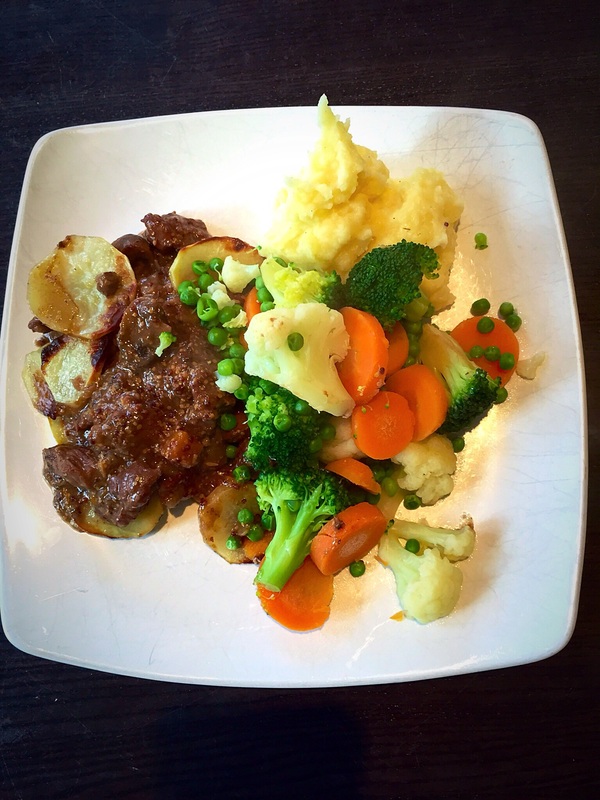 The combination of butter soft beef and a crispy potato topping is hard to beat! Toss the beef and flour together in a bowl with some salt and black pepper. Heat a large casserole until hot, add half of the rapeseed oil and enough of the beef to just cover the bottom of the casserole. Fry until browned on each side, then remove and set aside. Repeat with the remaining oil and beef. Return the beef to the pan, add the wine and cook until the volume of liquid has reduced by half, then add the stock, onion, carrots, thyme and mustard, and season well with salt and pepper. Cover with a lid and place in the oven for two hours. Remove from the oven, check the seasoning and set aside to cool. When the beef is cool and you’re ready to assemble the pie, preheat the oven to 200C. Transfer the beef to a pie dish, top with the circles of potato and brush with the butter. To serve, place a large spoonful of pie onto each plate with some green beans alongside.